It’s a year since I was officially stuck in a rut. I badly needed a creative boost but could only see as far as the projects in front of me that had bombed. I was fixated on what hadn’t worked, and my creativity was in a huge slump. Things needed to change. With the help of the most positive husband in history (except when it comes to football) and many prayers later, the opportunity to do more writing came along. Putting my original plans to one side, I grabbed it. Writing has given me a huge sense of purpose and satisfaction, but I don’t think you have to change your line of work if you’re feeling in need of a creative boost. There are three very simple things that have had a massive impact on how creative I am and how welI I make progress and that’s what I want to share with you here. No matter if you’re a writer, baker or candle-stick maker, if you’re in the business of creativity or you’re looking to improve your creativity, here are three things you can do to make it happen. I’m starting with the one thing that has given me the biggest creative boost, and it’s also the simplest. I had always imagined that working from home would be a total dream, giving me the freedom to run creative ventures around family life. Despite being more than happy in my own company, the reality was pretty different. I became isolated and with no one to bounce ideas off and turned into an even worse procrastinator than usual. With hindsight I’m surprised at how little I knew myself after having children. 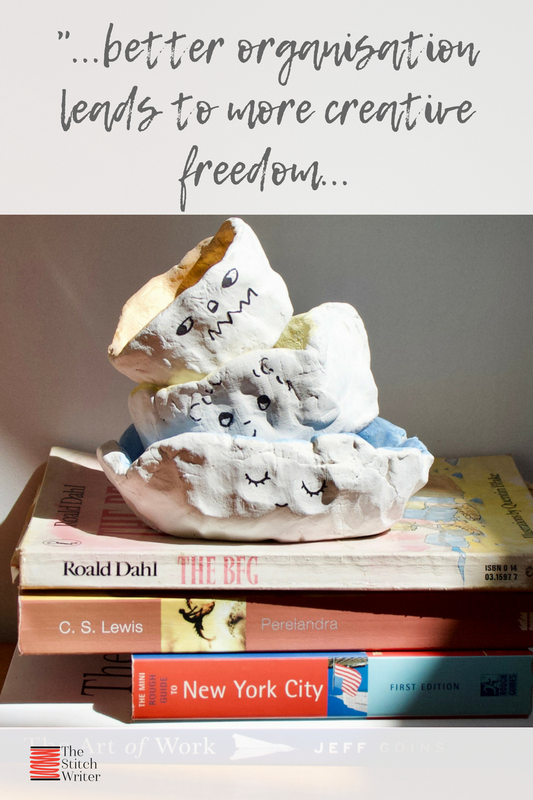 Seven years ago, it took months of nappies to make me realise I would shrivel up and die if I didn’t make time to be creative, and now it was taking a flirtation with depression to see I needed to be around others. If you recognise yourself in this scenario, then start to explore your options. Encouraged by my husband, I found there was a “co-working space” a few miles away and that I could rent a hot desk each month without breaking the bank. The building was a huge, renovated bus depot in the “cultural quarter” of the city with a high concentration of other creative businesses based inside. With a communal cafe downstairs and monthly events it seemed like a place that I could fit into, so I applied to rent the desk and was accepted. The bus ride and walk across town instantly made my world feel bigger. In the building itself I found there were other freelancers, also renting desks, that could help me with questions I had. Even better, it seemed that I was useful again since I could help them too. A few short weeks later and I was being given work by other businesses in the building and signed up as a mentor for local arts graduates. All I did was leave the house - but the wealth of opportunity was enormous and it gave me a creative boost to match. More focus, more fun, more productivity and a massive sense of purpose. If you have your own studio where you work alone, or it’s not viable for you to rent a desk or move locations, then think about a place that you can go to where you can’t get distracted by the ironing and there are other people to talk to and hang out with. Is it a local cafe with wifi and a good set of regulars you can get to know? Is it a monthly meet-up where local artists will get together and critique one another’s work? Is it a mastermind session each week with other creatives to share ideas, stay accountable and see progress? It’s dead simple, but dare to get out of the house and stop getting lost in your own head. I dare you not to be astonished by the difference it makes. Look, don’t be offended, but I’ve noticed a common theme amongst many creative people I know. They’re scatty. We have lots of ideas and then those ideas lead to other ideas and then those ideas lead to a lack of focus and stuff Does. Not. Get. Done. When I think of increasing creativity I think of freedom. When I think of focus and organisation I think boring and restrictive. But the truth is that better organisation leads to more creative freedom, not less. Here’s how I know that's true. On a Friday I take one hour to plan the week ahead. It’s very simple and here’s how it goes. I write down literally everything I need to do that coming week, from doing the food shop to writing product descriptions. I write a list of the days in the week and check if I have any appointments or places I have to be. For me personally it doesn’t work if I try to write after school when my kids are at home, so that makes a limit on how many hours in the week I have available to do all my stuff. In order of top priority, I start to allocate the orignal list I made to the days in the week, around the appointments. I also allocate a time limit or slot on how long each thing is going to take me. When I run out of time slots, that’s it. The other things either won’t get done or they’ll have to wait. I put it all in Todoist day by day and then get the satisfaction of ticking the things off the list as they get done. Other things - I make sandwiches the night before because it frees me up to do some exercise in the morning and still make the school run. I leave the housework until Saturday because it’s not more important than writing this post and, let’s face it, you can go on cleaning the house forever. Organising tasks like this means that once I’ve done them, I get to switch off. I get to not be constantly overwhelmed about how much there is to do and I get to go to bed earlier and actually get enough sleep. And that gives my brain tons of room to get the creative boost it needs. My family are useless at resting. That’s why we’ve come to realise how crucial it is. My husband’s grandmother, still going strong at age 91, still grows and tends her own vegetable plot. Before he died, my own grandfather, also well into his 90’s by then, forced himself to walk an extra 5 steps a day to regain the use of his legs after having a stroke. If we can squeeze in five minutes to iron a quick shirt or renew the car insurance then we will. And all that’s fine, efficient even. Lots of productivity books will tell you this is a good idea. Unless of course, you never stop. After realising that we were teaching our children a lack of satisfaction through frenetic activity, we decided to try some changes. Looking to Old Testament times for inspiration, we wanted to work out what one real day off, a “Sabbath”, would look like for our family. We decided no homework for the kids, no housework, no useful errands and definitley no kind of paid work. This is still very much a work in progress but has so far led to two little boys learning to ride bikes around the countryside with their mum and dad, and on Sunday afternoons, the kind of relaxed vibe you only get several days into a foreign holiday. It makes a MASSIVE difference. The days when we dare to rest, sleep more and really DO NOTHING, we all get up on a Monday, revived, refreshed and ready to run into the week. This is a creative boost by resting that I’m certain cannot be bettered, even by a feeling of getting everything done. Stop kidding yourself that you're invincible because if you don't you're heading for a crash that is going to put you so much further behind with the work you actually really want to accomplish. I just to think that rest was for losers - but now I reckon it's the other way round. 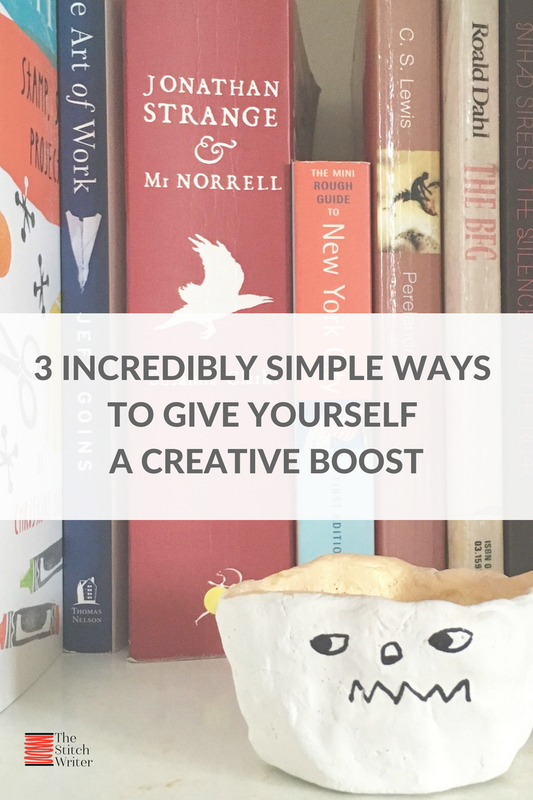 So, three ridiculously simple things you can do to give yourself a creative boost, and you can start right now. I'd love to know what the effect is and the circumstances you find yourself in when you're at your creative best. If you've got experience or tips on this topic, please share in the comments and give us all a creative boost!